Paper Mario: Sticker Star is an example of an installment that's okay on its own merits, but is considered awful in comparison to its predecessors and, to a lesser degree, its successor. Several unused enemies. Only the Ptooie has graphics. It's worth noting that some of these enemies (namely, the 2-Fold and 4-Fold Goombas, as well as the Shiny Dry Bones) are mentioned in the game's Prima Strategy Guide, meaning that they may have been removed later in development. Shiny Dry Bones and Shiny Spiny would later appear in Mario & Luigi: Paper Jam. Fish Bones, a recurring enemy in the Mario series, appear as obstacles in World 5-2: Jungle Rapids, leaping in the water and attempting to destroy the raft Mario uses to cross the river, and can be removed using the hammer. They are never battled in turn-based combat. However, they were likely originally meant to be fought in battle at some point, as they have sprites for being affected by the game's various status effects. One Lakitu appears in World 1-5: Whammino Mountain, throwing Spinies at Mario. However, it flies too high up to be attacked, but there is a purpose where one of these otherwise unused sprites can be seen as seen in this video as if the player gets a Star and jumps quickly when Lakitu drifts down towards Mario, Mario will hit Lakitu, revealing the top left sprite, but despite this, the other three hurt Lakitu sprites cannot be seen in any way. Interestingly, a sprite of what appears to be a fishing rod is stored with the Lakitu graphics, implying that the Fishin' Lakitu seen in several Mario games would have made an appearance here. A spiked green Pokey. Green, Super Mario Bros. 2-style Pokeys appear alongside their normal counterparts, but this version, which seems to be a combination of the two designs, does not. A bigger version of the Leaf sticker. A Piranha Plant sticker. Probably would have damaged enemies, like the Shell and Bomb stickers. A rock sticker. Probably would have acted like the Pebble from Paper Mario. A Spiny Egg sticker. Probably would have acted like the Spike Ball sticker, and likely would have been dropped by Lakitu. A Super Leaf sticker. Probably replaced by the Tail sticker. A crudely-drawn placeholder graphic present in the World 2 intermission BCREZ. A scrap of a pipe that's seemingly underground. Has a duplicate in the game's files. A scrap of a dead tree, similar to the ones on Whammino Mountain. Also has a duplicate. A...rather strange scrap of a Toad with what seems to be a Boo covering its body. Presumably, this was meant for the Enigmansion. Has a duplicate as well. A rather generic scrap of a piece of sky or water. A scrap of the bridge in 1-1. Strangely, it's on land instead of over the river. It's also used as a placeholder texture for various Paperization effect models. A scrap of some lily pads floating on water. A scrap simply referred to as item01 internally, despite resembling a bridge much more than the scrap that's actually called a bridge. Just a group of flower-based scraps (despite the second looking more like a weed than a flower). An early screenshot exists as a placeholder for the screenshots taken on-the-go for attacks that use particle effects like the Scissors. 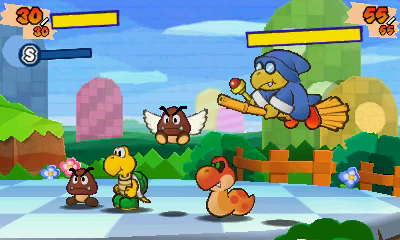 It features an early or test battle, involving a Goomba, Koopa Troopa, Paragoomba, a cut Koopa-like snake enemy and Kamek (or maybe just a normal Magikoopa, like in previous games). 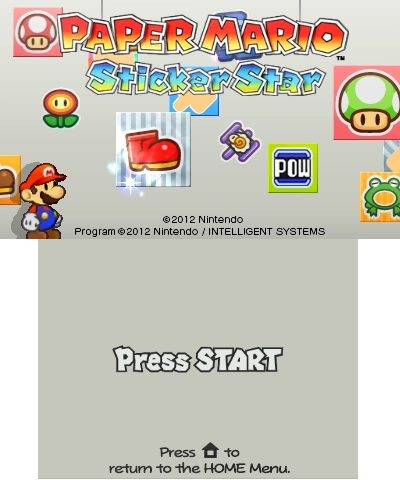 Similar game versions to this are depicted in prerelease materials. If Mario falls off a level, he will flap his arms and a sound effect will play (like in cutscenes where he falls), resulting in a Game Over. This isn't actually possible without clipping out of the stage with a glitch, or by hacking. However, Mario "falling outside a stage" is mentioned in at least the European digital manual. The copyright date in the Chinese version was updated. Let's grab the comet piece afterward. We'll get the comet piece after that. Kersti speaks this line if you use the first Tree Stump Scrap in Wiggler's Tree House before finding the first Wiggler segment. This is possible to see if the Comet Piece from Strike Lake is collected before finding the Wiggler segment in said level, as the segment will not flee to Loop Loop River despite it being made accessible. The Tree Stump Scrap found there can then be collected before battling the segment and having it join your party. The video to the right shows a glitch that can be exploited to collect the Scrap and exit the level without having to go where Wiggler's segment would be located, but as explained above glitching is not necessary. After placing the Scrap, approach the Comet Piece and Kersti will pop out and speak these two lines. This page was last modified on 5 April 2019, at 12:18.